Most everyone knows that professional Wrestling is not a legitimate sport. There is little about it that’s real. The quirks and characteristics that will personify each wrestler are created in corporate meetings. Each character is furnished with a distinctive “selling point” and slogans to accentuate his character. Each character has a “signature hold” that he uses to demolish opponents. It is rare that a character will win a match with any hold other than his signature hold. Characters regularly change personalities and even identities. The same person enters the ring, but now, he’s got a different name and different “characteristics.” Alliances shift with surreal regularity. The matches are scripted, and the winners of every match are determined before the bouts ever begin. Even the trash talk before and after the “fight” is meticulously scripted. In the 90s, Mick Foley was a professional wrestler with a particularly ludicrous persona. His “character” was a simpleton who lived in a boiler room and wore a leather muzzle to ensure he didn’t bite anyone. The character was called “Mankind.” He had to be kept separate from civilized society. – Mr. Foley made one point consistently and well – that it isn’t only wrestling that is fake. He freely admitted that wrestling wasn’t real, then consistently made – and supported – his contention that much of the “real world” was even less real than wrestling. Mr. Foley was on to something. The world that we label as real is frequently at least as fake as wrestling. Our generation has done an abysmally poor job of labeling reality. We have fabricated contests that don’t resemble anything that could actually happen to real people. These contests are then televised and labeled as “reality shows.” The message seems to be that real life is what occurs when people are talking directly into the cameras. To label these contests as anything but real would apparently ruin it for the simplest of minds. Calling the shows real seems to be all that is required for the simplest of minds to accept them as such. What passes for reality in prime time is every bit as unreal as professional wrestling. Another example of distorted reality comes from sources that once tried hard to be authentic – the news media. Today, one of the more visible news networks blatantly takes sides in the political arena, and supports one side without any pretense of objectivity in their reporting. I don’t mind that. Frankly, I find it more honest than the pretense of impartiality that I get from the other network news programs. But the honesty doesn’t extend very far. The network in question then proclaims itself to be “fair and balanced” for presenting a blatantly un-balanced view of the news. Apparently, the self-applied “fair and balanced” label is good enough for the large number of loyal viewers who never question that logic, accepting the “fair and balanced” label as gospel. 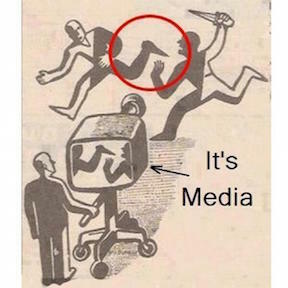 Equally confusing is the way the mainstream news media (they’re the ones pretending to be objective) report the news. In the old days, reporters just told us what happened during the preceding day. Not any more – simple reporting won’t sell commercials nowadays. Like professional wrestling, it now seems more important that news is entertaining than it is credible and accurate. Entertainment brings improved ratings. Accuracy and depth do not. Today, only the ratings matter, so television news has been “dumbed-down” and saturated with non-news to the point that there is little to learn from watching it. News in the past was about important happenings, or important people who affected the rest of us. Today’s “news” is more likely to be about tweets and unverified anonymous claims, or which movie star rants about Jewish people and which singer chooses not to wear underwear. On a day when nearly 100 people die in assorted wars around the globe, the lead story is likely to be about the wedding of two vacuous “beautiful people” whose marriage probably won’t outlast any of the wars. To achieve maximum entertainment value, the news media allow extremists to dictate the rhetorical terms that define the debate on many issues. In the debate over abortion for example, you hear no references to “pro-abortion,” proponents, and no references to “anti-abortion” proponents. Those labels are simple, descriptive, and accurate – and thus not suitably dramatic for prime time. Instead, the news media allow the two groups to label themselves. One group calls itself “pro-life” with the clear implication that their opposition is against life. The other group labels itself “pro-choice,” implying that their enemies are against free choice. It is completely inevitable that self-applied labels will (in nearly every case) promote biased agendas at the expense of truth. So, why do the media allow and encourage the self applied labels? It’s as simple as this. An angry war between unyielding extremists makes a more entertaining and compelling story than a reasoned disagreement between sensible human beings. The directive for reporters is clear and simple. Find, dramatize, and report conflict. If no conflict exists, generate some. One would never know from watching the news that moderate viewpoints even exist, although in nearly every case, moderate viewpoints dominate the political landscape and create the laws. Compromise is always the focal hinge of any democratic society. The unyielding political rhetoric that gets reported is so inconsistent with compromise that many people are surprised to find that Democratic and Republican leaders actually are civil (and even friendly) to one another in private. The Senate Lounge is perceived – (as is the wrestling locker room) – to be a hotbed of confrontation. In both cases, that is usually only an entertaining illusion. The civility and compromises that create actual policy aren’t dramatic enough to report. Only the illusion of warfare is sensational enough. News, (television news in particular) is only slightly more legitimate and real than professional wrestling, if it is more real at all. Long ago, we had political debates about important issues. Today, the debaters make semi-secret agreements between themselves to ensure that the issues don’t get discussed. The debates are deliberately set up to allow both sides the opportunity to present canned speeches without ever having to address any questions they haven’t both approved in advance. The debates themselves are just the beginning of the sham. In the old days there was time to think about what was said during a debate. One waited for the morning paper to find out what others thought. The interval provided time to make up your own mind about what was said, and what it meant. We don’t do it that way any more. Now, nothing is left to chance and no viewer gets any time to think unless he’s smart enough to shut the television off right after the “debate.” Now, immediately following the debate (often on every channel if it’s an important election) there will be a partisan spin doctor from each side telling the true believers from his side how to proclaim (and to believe) that their man won. Lost in all this spinning is the fact that (by mutual pre-arranged agreement between the debaters) nothing that resembles a real debate has actually occurred. Professional wrestling is as legitimate as politics, and way more real than these “debates.” At least some of the blood is real in wrestling. Throughout 2003, the Bush Administration successfully promoted and marketed the invasion of Iraq to the American people under the banner of “national security.” We were repeatedly told that Iraq was a threat to our security – that they had “weapons of mass destruction” capable of threatening us – and that the Iraqi dictator was aligned with the 9/11 terrorists. Later, the administration admitted that the weapons of mass destruction never existed, (or will never be found.) Later, the administration admitted that there was no evidence of any alignment between Iraq and the 9/11 terrorists. In spite of the admissions of error by their own leaders, a disturbing number of the administration’s supporters continued to refuse to accept the legitimacy of those admissions. Fueled by daily indoctrination from right-wing radio shows, many people still refused to relinquish their cherished illusions long after those who created the mis-perceptions have admitted they were mistaken. The disconnect between the beliefs of the followers and the admissions of error by their own leaders is incredible. Evidence and proof just don’t seem to matter at all. War is the most solemn responsibility of government, but even if the need for this invasion was real, the justifications for, and the marketing of, this war were neither more solemn, more real, nor more legitimate than professional wrestling. So, we must ask the obvious question – “Why IS reality being degraded?” It’s a simple matter of supply and demand. If there is no market for a product, the product will cease to be produced. The production of counterfeit reality has increased only because the demand for it has increased. Counterfeit reality is so prevalent because it sells so well. True, evidence based reality is so rare because there is no real market for it. Evidence based reality is too complex and difficult for the simplest of minds – and in case you hadn’t noticed, commercials are aimed at the simplest of minds. That is important because commercials are what is being sold on television – commercials are the product, while the programming is just the window dressing that draws attention to the product. It really isn’t some vaguely defined THEM who has undercut reality, it’s us. The problem is caused by our eagerness to purchase, consume, and wallow in counterfeit reality. The underlying cause of the preponderance of counterfeit reality is our reluctance to undertake the difficult task of understanding complex reality. We demand simplicity … and reality is seldom able to fill that order. The whole truth is seldom simple, and never easy. It isn’t our culture’s willingness to produce illusions that devalues truth … it’s our eagerness to consume those illusions and to accept them as real in spite of clear evidence that they are fake. It’s sad that we have gotten to this point. Evidence and reality did once matter. I swear they did. . . and not so long ago either. Someone will undoubtedly call me unpatriotic for noticing that something is wrong in our culture. But, if you own a business that is failing, it’s not the malcontents in your employ that you ought to be worried about. It’s the ones who are content with your failure that ought to worry you. I think we should apply the same concept to culture and governance. It’s those who don’t mind losing contact with reality that we ought to be concerned about and pressure to change. During the decline of a previous culture, the Roman Emperor Nero supposedly fiddled while his city burned down around him so that he could deny the reality of the disaster. During a real fire, there are no medals reserved for those who successfully deny the need to put the fire out. The real heroes are those who acknowledge, confront, and help extinguish the flames. Verlon Gates is a retired veteran of 62 years. He has spent most of those years questioning orthodox answers and seeking alternate viewpoints which better explain life, existence, and the universe. Mr. Gates believes that there are two basic kinds of people. Those who invest their energy in defending who/what they already are, and those who invest their energy into improving who/what they already are – trying to “become more” than who/what they already are. His goal is to be one of the people who are constantly trying to “become more” than they already are. To accomplish that goal, he tries to be a “respectful skeptic, not a hard-bitten cynic."